1.DVD Songs are with 720P resolution.1080P HD file is very big, the hard drive couldnât load so many songs for 1080P files. 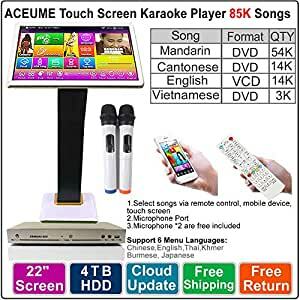 The video effect is enough for karaoke singing. If you mind this point and very care about paper user manual, we don’t suggest you get our karaoke product. 3.We cherish every customer and regards each customer as our best friend. We have been providing the best product and service for customers.we could provide free return and exchange service if you found the player has problem after you receive the item.But we need your communication first because sometimes it just because the operation is improper or the cable is loose during transit. 4.2 MIC are free included, They are just for home singing, if you want to get professional karaoke effect, please get professional microphones.